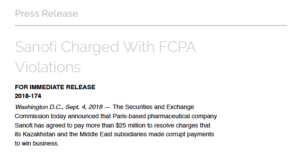 The SEC fined pharmaceutical company Sanofi over $25 million for paying illegal foreign kickbacks to government officials in Kazakhstan, Levant, and the Gulf. As explained in the SEC’s Order imposing the sanctions, employees and agents of certain Sanofi subsidiaries paid the illegal foreign kickbacks to improperly influence officials of Kazakhstan, and countries in the Levant and Gulf regions, and to increase sales of Sanofi’s pharmaceutical products. The Order stated that Sanofi generated the funds that it used to pay the illegal foreign kickbacks by creating fake expenses for: (1) travel and entertainment; (2) product samples; (3) clinical trial and consulting fees; (4) round table meetings; (5) distributor discounts; and (6) credit notes to distributors. These fake expenses were falsely recorded as legitimate on Sanofi’s books and records. Apparently the scheme was complex and involved several stages to execute. For example, the Kazakhstan scheme seems to have involved senior managers of Sanofi colluding with distributors to kick back funds to local Sanofi employees. The local Sanofi employees then used those illegal foreign kickbacks to bribe foreign government officials in Kazakhstan. According to the SEC, Sanofi’s internal spreadsheets tracked the illegal foreign kickbacks sent to the Sanofi employees in Kazakhstan. Those internal spreadsheets listed the foreign kickbacks as “marzipans”. Additional facts, as well as details about how the scheme operated in Levant and the Gulf, are set forth in the SEC’s Order. If you are interested in reading more, an external link to the SEC’s Order is provided at the bottom of this page. 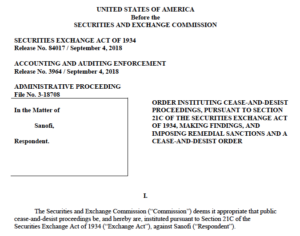 The SEC found that Sanofi failed to create and maintain sufficient internal accounting controls to make sure that it recorded its expenses properly. It also found that Sanofi did not maintain an effective anti-corruption compliance program in connection with Kazakhstan, Levant, and the Gulf. Thus, Sanofi’s illegal foreign kickbacks and its deficient books and records violated the Foreign Corrupt Practices Act (“FCPA”). Bribery in connection with pharmaceutical sales remains as a significant problem despite numerous prior enforcement actions involving the industry and life sciences more generally.